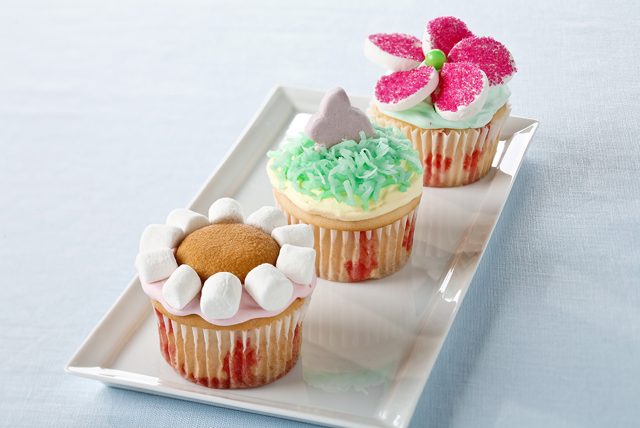 Make Flower Garden Cupcakes with marshmallows, colored sugar and more. Our Flower Garden Cupcakes make your dessert table look like a garden in bloom. Prepare cake batter and bake as directed on package for 24 cupcakes. Cool in pans 10 min. Pierce tops with fork. Add boiling water to gelatin mix in small bowl; stir 2 min. until completely dissolved. Spoon over cupcakes. Refrigerate 30 min. Tint COOL WHIP with food coloring(s) as desired; spread over cupcakes. Marshmallow Flowers: For each flower, cut 1 large marshmallow into 5 slices; press cut sides in colored sugar. Arrange on cupcake to resemble flower. Add small candy to center of each. Bunnies: Top cupcakes with tinted coconut and marshmallow bunnies. Flowers: For each flower, place 1 wafer on top of cupcake; surround with 10 miniature marshmallows.